William Henry make beautiful knives. I highly recommend these knives. Beautiful works of art and tools. 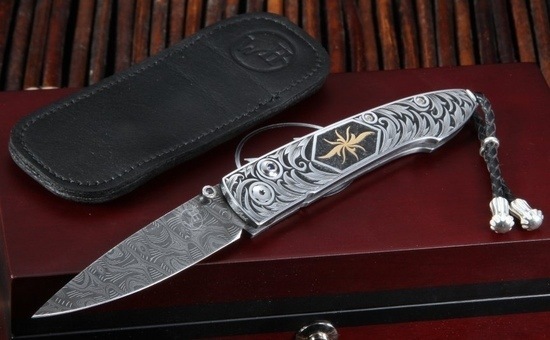 This is a William Henry B10 Corona Engraved Damascus Folding Knife. This particular knife is a limited edition of which only 5 were ever produced. The handle features hand engraved stainless steel with gold inlay by Don Patch. The button lock and thumb stud are inlaid with sapphires, the bale is made of sterling silver and there is a braided leather lanyard with metal beads.